The College Mace. Sterling silver gilt. With crown surmount and raised Glasgow coat of arms. 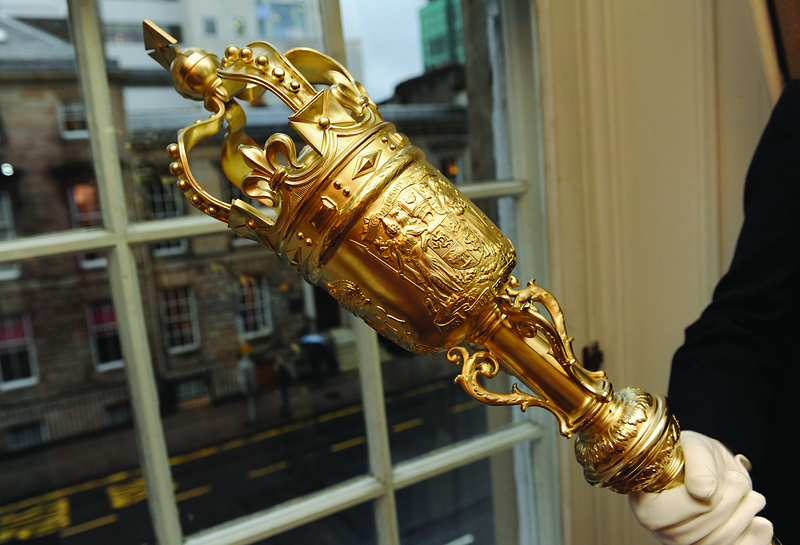 Inscribed "This Mace Presented to the RFPSG, by James Walker Downie to Commemorate the Granting of the Prefix 'Royal' to its title by HM King Edward 1910". The actual design and execution of the mace was by Mr Frank Lutiger of West Kensington, London. Messrs. J. Seaton and Co., London, “The College Mace,” Heritage, accessed April 20, 2019, https://heritage.rcpsg.ac.uk/items/show/32. Description: The College Mace. Sterling silver gilt. With crown surmount and raised Glasgow coat of arms. 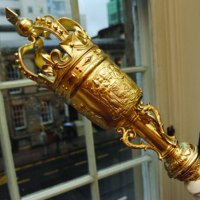 Inscribed "This Mace Presented to the RFPSG, by James Walker Downie to Commemorate the Granting of the Prefix 'Royal' to its title by HM King Edward 1910". The actual design and execution of the mace was by Mr Frank Lutiger of West Kensington, London.